The Bell OH-58 Kiowa is a family of single-engine, single-rotor, military helicopters used for observation, utility, and direct fire support. Bell Helicopter manufactured the OH-58 for the United States Army based on its Model 206A JetRanger helicopter. 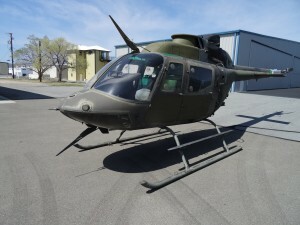 The OH-58 has been in continuous use by the U.S. Army since 1969, where it served extensively in the Vietnam War as a light observation and scout helicopter. The OH-58 primarily performed low-level, low speed, visual reconnaissance (VR) missions to search for, find and mark for gunships the elusive enemy and conduct bomb-damage assessment (BDA) missions while being protected by gunships flying above. Due to their low-altitude missions the scout aircraft and crews often became victims of enemy small-arms fire. Repairing combat damage was the norm for those in maintenance. Equipped with a more robust engine, the OH-58C was supposed to solve many issues and concerns regarding the Kiowa’s power. In addition to the upgraded engine, the OH-58C had unique IR suppression systems mounted on its turbine exhaust. Early “C” models featured flat-panel windscreens as an attempt to reduce glint from the sun, which could give away the aircraft’s location to an enemy. The windscreens had a negative effect of limiting the forward view of the crew, a previous strength of the original design. The aircraft was also equipped with a larger instrument panel, roughly a third bigger than the OH-58A panel, which held larger flight instruments. The panel was also equipped with Night Vision Goggle (NVG) compatible cockpit lighting. The lights inside the aircraft are modified to prevent them from interfering with the aircrews’ use of NVGs. OH-58C aircraft were also the first U.S. Army scout helicopter to be equipped with the AN/APR-39 radar detector, a system which allowed the crew to know when there were anti-aircraft radar systems in proximity to the aircraft. Some OH-58C aircraft were armed with two AIM-92 Stingers. These aircraft are sometimes referred to as OH-58C/S, the “S” referring to the Stinger installation. Called Air-To-Air Stinger (ATAS), the weapon system was intended to provide an air defense capability. Over 10% of all combat and combat support deaths in Vietnam occurred in helicopter operations, a combined total of 6,175 (2,202 pilots, 2,704 aircrew and 1,269 passengers). About 86% of these causalities were U.S. Army. In addition to the human cost, the helicopter “casualties” of the war were staggering. A total of 11,800 helicopters of all types served in Vietnam. Approximately 5,000 helicopters were destroyed there, of which all but 500 were U.S. Army. Typical armament included one M134 7.62mm caliber Minigun (or) one M129 40mm Grenade Launcher (or) one M296 or M3P .50 caliber Machine Gun. Each Crewchief and Doorgunner also carried a secondary weapon, usually an M-16 rifle but sometimes more exotic types. Pilots were not issued M-16’s, they often carried other unauthorized weapons slung over their armored seats for personal protection. Crewchiefs and Doorgunners always carried colored smoke grenades. These were used to mark targets for the Gunships when receiving hostile fire or to mark landing zones (LZ’s). All aircrew were issued body armor, often stowed under his seat for protection from enemy weapons fire from below. In Vietnam the OH-58 had a crew of two: Aircraft Commander (A/C), Co-pilot or “Observer”, Crewchief (C/E) / Doorgunner. The Kiowa’s mission was to serve as a light observation and scout helicopter. The OH-58 primarily performed low-level, low speed, visual reconnaissance (VR) missions to search for, find and mark for gunships the elusive enemy and conduct bomb-damage assessment (BDA) missions while being protected by gunships flying above. Due to their low-altitude missions the scout aircraft and crews often became victims of enemy small-arms fire. Repairing combat damage was the norm for those in maintenance. On 27 March 1970, an OH-58A Kiowa (s/n 68-16785) was shot down over Vietnam, one of the first OH-58A losses of the war. The pilot, Warrant Officer Ralph Quick, Jr., was flying Lieutenant Colonel Joseph Benoski, Jr. as an artillery spotter. After completing a battle damage assessment for a previous fire mission, the aircraft was damaged by .51 cal (13 mm) machine gun fire and crashed, killing both crew members. Approximately 45 OH-58A helicopters were destroyed during the Vietnam War due to combat losses and accidents. One of the last combat losses was of an OH-58A (s/n 68-16888) from A Troop, 3-17th Cavalry, flown by First Lieutenant Thomas Knuckey. On 27 May 1971, Lieutenant Knuckey was also flying a battle damage assessment mission when his aircraft came under machine gun fire and exploded. Knuckey and his observer, Sergeant Philip Taylor, both died in the explosion. the famous AH-1G, are searching documentation or photos of Main rotor. you can kindly help me ..